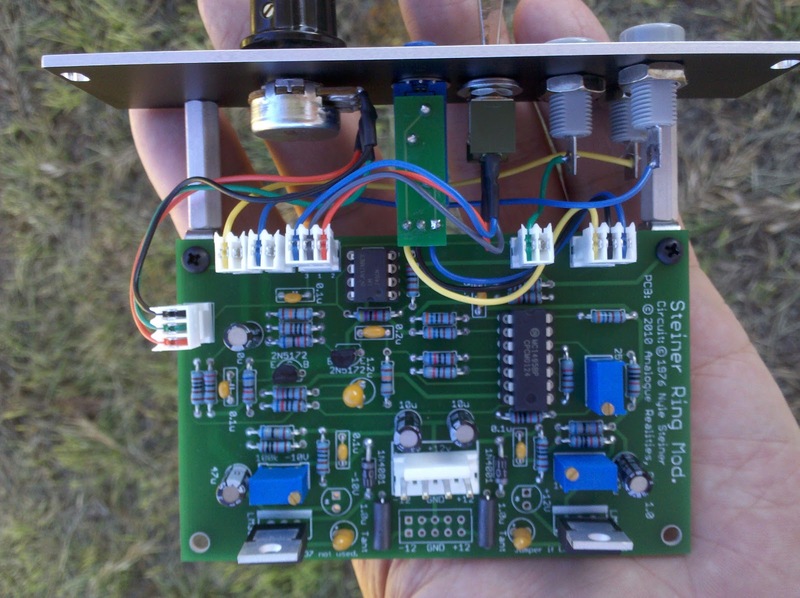 Steiner Synthasystem DIY: Ring Modulator complete! 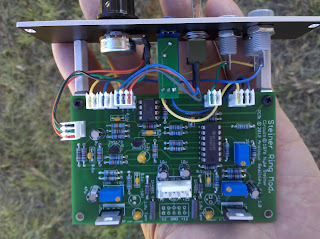 And, the Ring Modulator has also been completed! This uses an MC1495 IC (four quadrant multiplier), which is certainly a more frequently encountered solution (with a variety of different chips & circuits) than the diode "ring" design. It has a couple of trimpots, for the Signal Null and Carrier Null... they're pretty simple to set. Obviously the one is on the front panel, but I'm not sure why, i.e. if it needs more frequent adjustment or what. There's also a pot to adjust the mix of original signal to modulated signal, which could prove interesting to play with. While I'm at it, let me admonish the reader to watch out for those blue plastic panel-mount trimpot assemblies. The threads are very prone to being stripped, and, as they're plastic (and have some flashing), they're quite easy to strip if you're not careful (and sometimes even if you are careful... oops!). 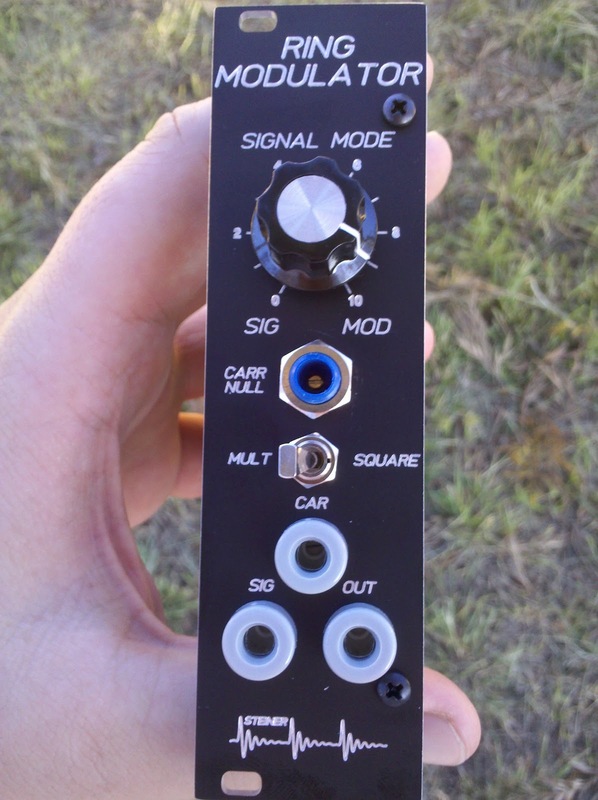 And finally, there's a Mult/Square switch. In the multiply position, it acts as a standard ring modulator. However, in the squared position it sends the signal input to the carrier input too... honestly, I'm not sure why this wasn't originally implemented with a normalled jack (as they're used in other situations in the Synthasystem), but no matter - for me it'll save a banana cable! Theoretically I think it is supposed to double the frequency, but instead it just seems to change the signal a bit. I honestly haven't played around with this a whole lot (mostly just setting the trimmers), so I'm sure there's quite a bit to discover.